I recently picked up some used KW V2s and it appears one of the springs is bad. Its much shorter than the other front spring for some reason, very odd. Anyways I can't achieve the proper ride height and need a replacement ASAP. 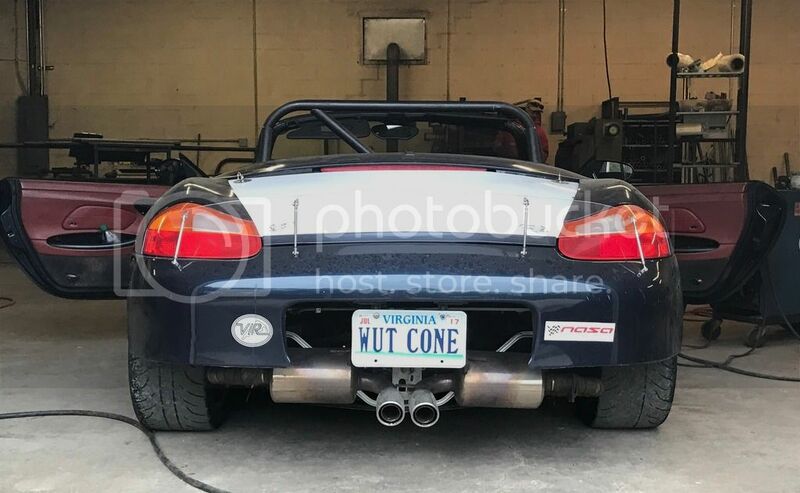 I have an track daythis Saturday! KW has replacements but it doesn't appear they're going to get here in time. Any ideas? Can you use springs from a different coilover setup temporarily? By the way I've been leaning on this form a lot lately, thanks for everyone's help getting this car together! Or, one of the springs isn't rotated properly and so it is not sitting flush with the lower spring perch, but instead is sitting up on the lip, that would give it what look like about 15mm extra height? KW uses a proprietary spring diameter - it comes out to 2.4 inches vs the standard 2.25 or 2.5. You can use a 2.5 depending on the brand of spring but you need to make sure the perch will accommodate it. Also I don't remember the designations for springs "lb" rating that is stamped on the spring if there is one - also I believe their spring rates are progressive so it's not standard in that respect either. Is the tender spring there on both? Last edited by rastta; 04-17-2017 at 06:07 AM. Maybe the height adjustment is different for one side - I think they are progressive and the first bit to compress probably goes at a pretty easy rate, like a built in tender spring. Count the coils - does each side have the same amount of turns. In order to remove coilovers, it is easier if you can compress them as much as possible by running the height adjustment all the way to an excessively low setting. If one side was turned less than the other during the removal process, this could make them look quite different. It looks like they can be set from a range of .8" lower up to 1.5" lower according to their marketing. The following instructions contain the minimum and maximum acceptable range of adjustment for the spring collars. 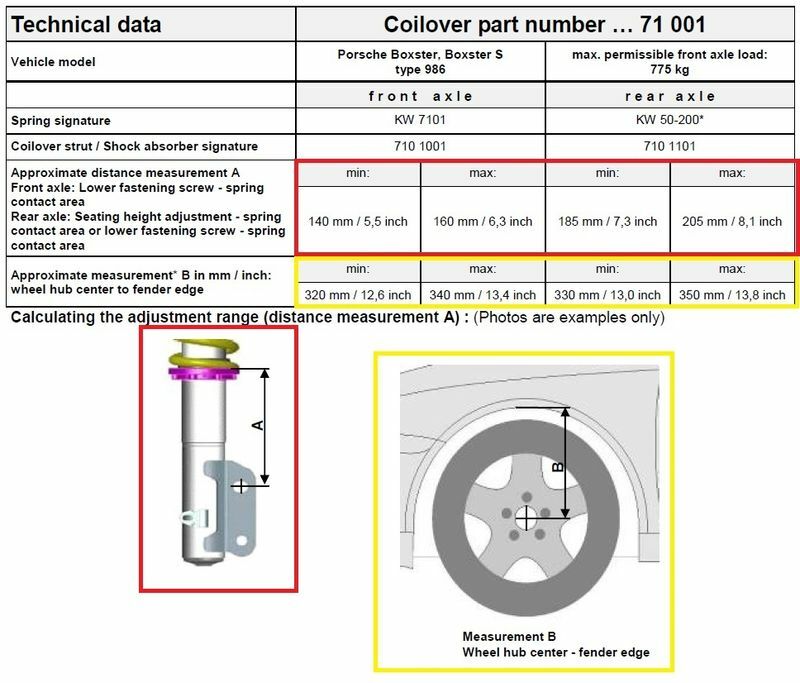 It looks like you can use the dimensions for "A" to set the coilover in the approved range and then you can use "B" as a check. Or you can pick you desired "B" setting and map it to the proper part of the range of "A" to get you close to your desired setting as a starting point. This previous thread might shed some light on this and shows the type of springs fitted. No tender spring. Definitely progressive springs - not standard "straight" coilover springs. Not sure you'll find anything out there to substitute. Thanks for everyone's help! KW is looking for an alternative spring that's in stock, fingers crossed! They seem like they have great customer support. Since you seem to have no margin for error I'd suggest you get 2 springs. That way you don't end up last minute having 2 mismatched springs and outta time. That's the plan, and you're right about zero margin! I've knocked out the list below over the last two weeks and dropped the car off this morning to have a roll cage installed. It's going to be incredible if this all works out. Last edited by truegearhead; 04-17-2017 at 12:01 PM. 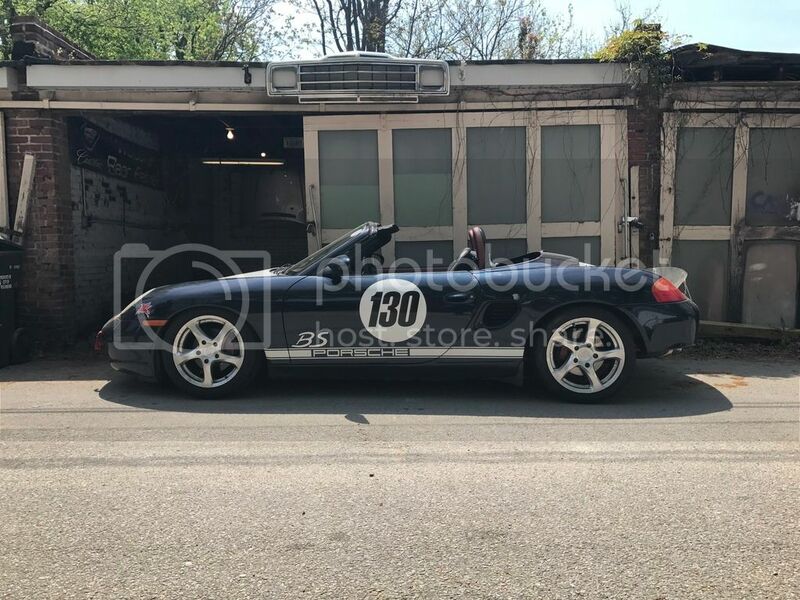 Looking good, and I actually saw one other car with a Lexan spoiler similar to yours, one of my first instructors that raced an F class 2000 Boxster S. He had the Lexan mounted to the OEM spoiler in such a way that he could raise and lower it to make adjustment. Good luck with it all and for this weekend! KW confirmed all spring options are 30 days+ out so that's not an option. Tarret can over night me Swift springs which are 60mm in diameter (1mm under KWs) and are available in 450lbs and 500lbs (they may be able to get other rates I'll know tomorrow). I'm not sure what length will work with KWs and I'm not sure if KW shocks will handle that rate (I doubt it). The KW front rates are published simply as progressive but the rears are only 285lbs! What do you guys think? The car is under 2500lbs so the 450/500 rate is probably too stiff anyways. Think I would be safe with a 350lb spring? What would you go with? Any ideas what length I should get? If the car weren't in a shop an hour away getting a roll bar installed I'd go measure. Spec guys run PSS9's with similar weight springs so I'm sure the KW's can handle it - as they are adjustable. As for spring length - you'll have to measure but I'd say a 7-8" spring would probably be enough if you weren't doing a tender spring. The H&R coilovers use a 160mm spring in the front with a tender spring. UPDATE (3 days until VIR): The member who sold me the coilovers agreed to pay for the replacement springs! Awesome guy, you've got to love this community. KW proved not be much help and couldn't give me spring rates, or spring lengths but I took a guess and ordered a set of Swift springs from Tarret. They're rushing me out two that'll be here by Thursday evening, this is getting tight. I also just got a call from the cage shop that is having a problem with fuel lines that close to weld points so I'm stopping in there tomorrow to try and find a solution. With any luck this will all come together, looks like I'll be changing springs and aligning he car at the track Friday night. I do have one new wrinkle I'll have to work out, I normally run on slicks and have some autocross 200 tread wear street tires with but they're a little low. It's supposed to dump rain Sunday so oddly...I might bring wheels with winter tires on them. I'm heard their soft compound and deep tread actually work well at speed in standing water. Seems crazy but I might give it a shot of it gets bad. Here's an interesting Road and Track article I'm drawing the idea from. Last edited by truegearhead; 04-18-2017 at 01:41 PM. (Update 2 days left). The bar is in!